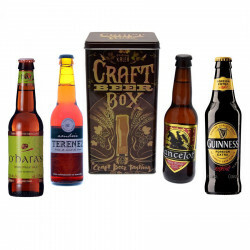 The vintage "Craft Beer Box" contains 4 original beers. 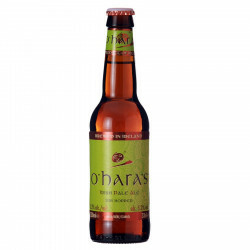 A perfect balance between the traditional Irish Pale Ale and the dry-hopping of American Pale Ale. 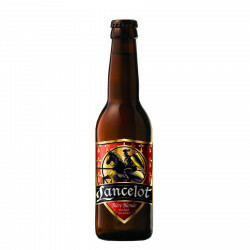 Red beer from Brittany with fruity and spicy notes. Blond beer from Britanny. Like the Trappist beers of high fermentation, this one is unfiltered, unpasteurised and fermented in bottle thanks to honey. A version of the mythical stout beer brewed with more roasted hops and barley than the original recipe. Width and depth: 12 cm. 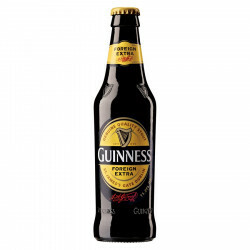 The Foreign Extra is part of the Guinness range. It is brewed in Ireland and is mainly distributed in African countries. 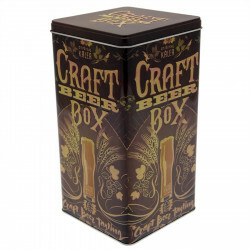 Pretty vintage box with the message "Craft Beer Box". 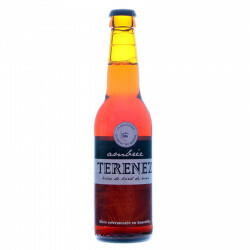 Discover the amber Terenez beer from La Brasserie du Bout du Monde. 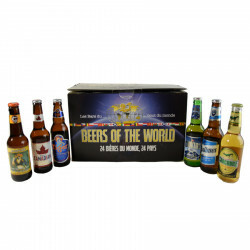 Gift box including 24 beers of the world from 24 different countries with blond, red and stout beers.